A petition has been filed before the High Court of Calcutta, demanding that Election Commission of India be directed to disallow the Trinamool leaders involved in the recent sting operation conducted by Narada News from contesting in the forthcoming West Bengal Assembly Elections. The petition, filed by Mr. Amitabha Chakraborti and Mr. Sk. Abu Abbasuddin demands that the video footage of the sting operation be handed over to the Central Bureau of Investigation. The petition states that the “bribery footage showing politicians taking money to the amount of Rs 4 lakhs to Rs 20 lakhs, is indeed a matter of shame for our society for they are entrusted by people for the betterment of their lives and society as a whole.” It hence demands a direction to the CBI to ascertain the authenticity of the video, and thereafter book the culprits for bribery and malpractice, in order to “safeguard the democratic interest of the country”. It came up for hearing on Friday, before a bench comprising Chief Justice Manjula Chellur and Justice Arijit Banerjee, which directed it to be taken up for hearing on March 22. The sting operation, conducted by Mathew Samuel and Angel Abraham of Narada News had exposed All India Trinamool Congress heavyweights taking wads of cash from a fictitious company. The released footage has 11 Trinamool leaders – Mukul Roy, Minister Subrata Mukherjee, Firhad Hakim, Madan Mitra (Transport Minister at the time the footage was gathered), Mayor of Kolkata Municipal Corporation Sovon Chatterjee, Member of Parliament Sougata Roy, Subhendu Adhikari, Sultan Ahmed, Kakoli Ghosh Dastidar and Prasun Banerjee, Member Legislative Assembly Iqbal Ahmed, and IPS Officer M.H. 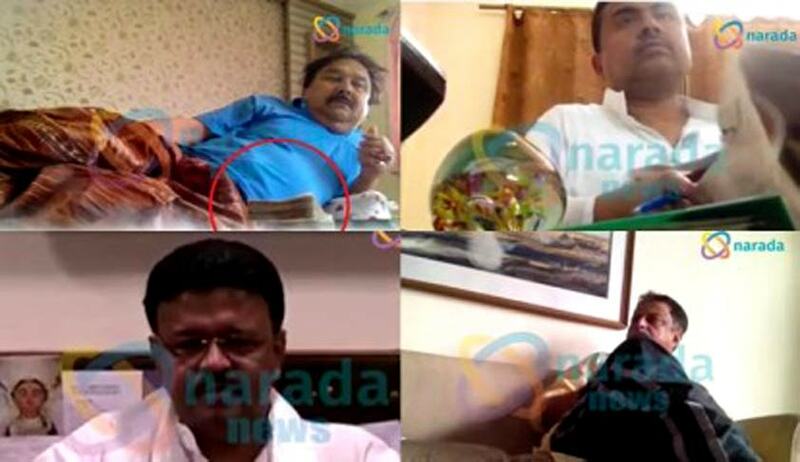 Ahmed Mirza who is seen in the video footage flaunting his proximity to Mukul Roy.